Small Arts & Crafts Address Plaque - - possibly the most beautiful illuminated house number sign you'll ever see. Holds up to three numerals. Made in USA. Select one of these designs for the front panel: Pasadena (small image) and Willowglen (large image) with architectural bronze finish and honey glass panel. Dimensions: 13"W x 2"D x 6"H.
Need more numerals? 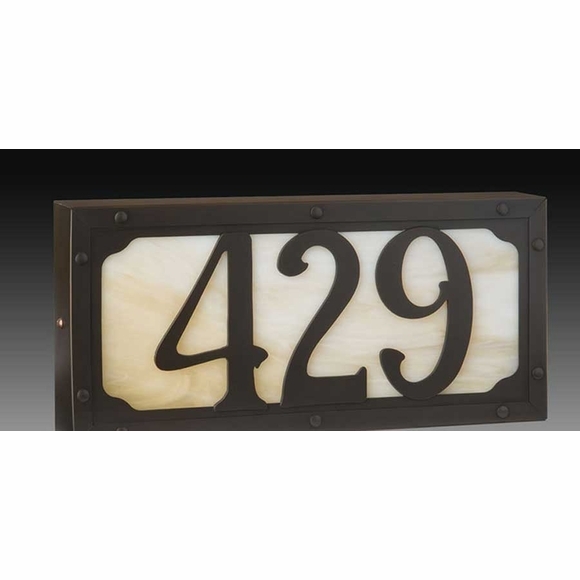 Comfort House also sells the four-number and five-number versions of this Arts & Crafts style address sign.